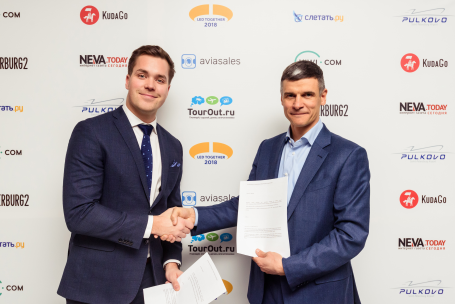 Kiwi.com, a pioneer in applying state-of-the-art technological solutions to the travel industry, announced the formation of a strategic partnership with Pulkovo International St. Petersburg Airport, aimed at building a Hosted Stopover Program for Self-Connect and Virtual Interlined passengers at Pulkovo Airport. Under the new Hosted Airport partner program, Pulkovo Airport is joining efforts with Kiwi.com to deliver a fast, comfortable and hassle-free transfer product for the benefit of passengers and all of the full-service and low-cost airlines operating at the airport. Pulkovo Airport welcomed over 18.1 million passengers in 2018, which represents a 12.4% increase in traffic numbers year-on-year. The “Virtual Interlined” product will give passengers the reassurance of the backup that Kiwi.com provides, such as customer service, wayfinding and advanced passenger communication – for example, if a flight is going to be delayed a notification will be sent to a passenger and alternatives suggested. This will be the first self-connect project in Russia’s airport industry. “We are excited to launch the self-connect project at Pulkovo, partnering with Kiwi.com, a global leader in online booking services. Combining St. Petersburg Airport’s excellent transfer infrastructure and perfect location between Europe and Asia with Kiwi’s unique expertise, we strive to develop a revolutionary product on Russia’s market. In partnership with Kiwi.com we will be able to significantly enhance transfer service for travelers, providing passengers with personalized connection offers and the airlines with new market opportunities via St. Petersburg”, said Vladimir Yakushev, Chief Executive Officer of Pulkovo International Airport operator Northern Capital Gateway LLC. “We are delighted to be partnering with Pulkovo Airport to assist in delivering this transfer product benefiting both passengers and all full-service and low-cost airlines which operate out of this key Russian airport. The airport is growing massively and at Kiwi.com we are matching this growth as we strive to make travel better for both users and providers”, said Zdenek Komenda, Chief Business Development Officer at Kiwi.com.